Etihad Airways has confirmed its major growth strategy by announcing firm orders for 199 Airbus and Boeing aircraft and no fewer than 294 engines to power them. 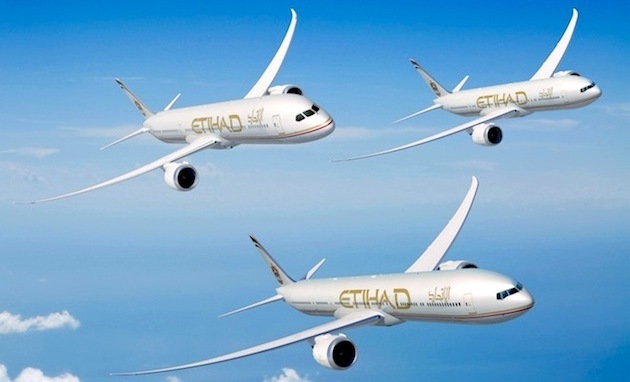 The deals, announced at the Dubai Airshow on Sunday, sees Etihad order 56 new Boeing widebody aircraft, with options and purchase rights for a further 26, and 87 Airbus aircraft with purchase rights on 30. The airline also ordered 30 Boeing 787-10s, making Etihad the largest airline customer for the 787, when combined with previous orders for 41 of the 787-9 variant. The 787-10 commitment takes the 787 order book to over 1,000 aircraft. From Airbus Etihad has signed for 50 A350s (comprising 40 A350-900s and 10 -1000s) plus 26 A321neos and 10 A320neos, and a single A330-200F freighter. Those equity partners include Virgin Australia, as well as airberlin, Air Seychelles, Aer Lingus and Air Serbia. Etihad has also received regulatory approval for a proposed 24 per cent investment in India’s Jet Airways, and has taken a 33.3 per cent stake in Swiss carrier Darwin Airline. The latter, Eithad announced at the Dubai Airshow, is to be rebranded as Etihad Regional and which will connect secondary European markets “onto the main networks of Etihad Airways and its equity alliance partners”. Etihad Regional will be Etihad’s first branded regional operation. “The revenue benefits of our equity alliance, to all the members, have always been clear. But the real strength of this strategy lies in the opportunity for business synergies which can improve the operating costs of all the partners. This means all our strategic partners will have the chance to benefit from it,” James Hogan, president and chief executive officer of Etihad Airways, said. All the Boeing aircraft in this order will be powered by General Electric GE9X, GEnx and GE90 engines. The purchase of 127 engines includes 57 GE9X engines for the 25 777X aircraft, 68 GEnx-1B engines for the 30 Boeing 787-10s and two GE90-115B engines for the 777-200F freighter. The A350s meanwhile will be powered by Rolls-Royce Trent XWBs, and the A320/321neos by CFM LEAP powerplants. The first of the new Boeing aircraft to join the Etihad Airways fleet will be the 787-10s, which will begin arriving in 2018, followed by the 777-9X from 2020 and the 777-8X from 2022. The A350 deliveries will commence in 2020, the A320/321neos from 2018. Etihad Airways currently has 86 aircraft in service. 777X and 787 in Etihad colours. It takes vivid imagination to be able to commit to such large purchases of aircraft.Is passenger growth going to keep up with the airline seat availability or will we see aircraft flying at 50% capacity? If I read this article correctly, Eithad has ordered aircraft that will slot into their joint venture partners ie., VA in our case, which gives J.B. and his team a great ability to select the right airframe to suit the long/short haul out of Australia as and when needed.